Similar to varicose veins but much smaller and less palpable, spider veins are very narrow, harmless blue or red veins that primarily crisscross over the legs, thighs and nose. 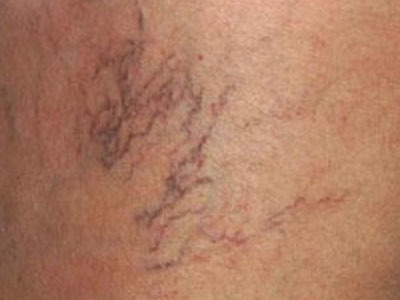 Somewhat resembling broken spider webs, spider veins send millions of people to dermatologists each year for the removal of these visibly unattractive spider veins. Our specialists at Mayoral Dermatology offer clients several treatment options that are designed specifically to safely eliminate spider veins–sclerotherapy, GentleYAG™ Laser and Vbeam® Perfecta Pulsed Dye Laser therapy. Spider veins do not bulge out from under the skin. Although their distinct reddish or bluish color may be readily visible under fair skin (which makes them look worse than they really are), you won’t be able to feel them when running a fingertip over the spider veins. Alternately, varicose veins protrude and can be felt as a slight ridge on the skin. Spontaneously arising due to venous dilation promoted by weakened blood flow and blood pooling, telangiectasia (the medical term for spider and varicose veins) is thought to emerge when higher pressure levels are required to pump blood back to the heart from the lower extremities. This forced blood gets “backed up” in veins and creates pooling in the strained veins. Gravity also exacerbates the inability of blood to flow normally from bottom to top, which is why spider veins frequently mottle the legs, backs of the knees and ankles. The exact mechanism of spider vein development involves tiny “flaps” or valves in veins that prevent the backward flowing of blood as it enters the legs. When these valves are not working optimally, blood leakage into the veins collects and pools. Consequently, doctors refer to spider veins and varicose veins as “venous insufficiency” conditions. Spider veins are usually asymptomatic, unlike varicose veins which sometime cause leg aches and pains. On rare occasions, someone with spider veins may feel a slight burning or itching sensation in areas that are heavily trafficked by spider veins. According to the Womenhealth.gov website, nearly 55 percent of all women experience spider veins in varying degrees of severity. While inherited tendencies for spider vein development may be next to impossible to sidestep, adopting healthy lifestyle choices may reduce the risk of suffering venous insufficiency. Wearing sunscreen, exercising every day, practicing weight control, elevating legs when resting, wearing low-heeled shoes and watching your salt intake are all actions recommended to maintain vein strength and prevent blood pooling. 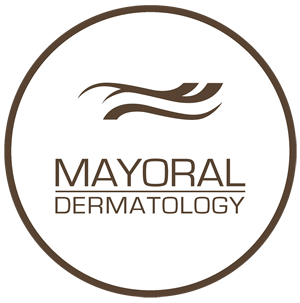 Mayoral Dermatology provides state of the art therapies that quickly and painlessly eliminate spider veins. One popular method used by dermatologists is sclerotherapy, which involves the injection of a sterile salt solution into weakened veins. By swelling vein walls enough to make them stick together and seal , this solution effectively stops blood flow and the pooling associated with spider veins. Eventually, these inactive veins simply convert to harmless scar tissue that initiates fading of spider veins. Patients usually witness the disappearance of spider veins within two to three weeks. Anyone is eligible for sclerotherapy except pregnant or nursing women. Additional contraindications may include patients on a regimen of corticosteroids, diabetics or people suffering from deep vein thrombosis. Our Mayoral Dermatology specialists will take a complete medical history and discuss options regarding sclerotherapy or other spider vein therapies if necessary. Targeting spider veins with this powerfully effective, high-intensity laser beam coagulates blood pooling in veins while simultaneously stimulating collagen production. Not only do spider veins fade but skin is also revitalized and refreshed by rich amounts of new collagen. The Vbeam® Perfecta Pulsed Dye Laser is excellent for treating spider veins on the nose as well as the bright red flushing associated with rosacea. Additionally, Vbeam Perfecta PDL uses a patented cooling system that sprays a refreshingly cool mist onto your skin immediately prior to each issuance of a laser pulse. Painless and comfortable, treatment sessions require no post-treatment attention so patients can receive this type of spider vein therapy at lunch and immediately return to work. Another option that has proved highly effective in diminishing unattractive spider veins is the revolutionary GentleYAG™ Laser system. Therapeutic heat is applied to veins using a high-energy laser beam that promotes thermocoagulation of blood vessels. Once blood vessels are permanently clogged, the body gradually assimilates the dead vessels, leaving a once mottled area of skin looking clear, healthy and evenly toned. In addition, patients experience a comfortable, chilled sensation during the procedure because the skin receives cooling sprays of cryogen per each laser burst. Painless and fast, the GentleYAG™ Laser can let you to wear your favorite shorts, swimsuits and sundresses once again without feeling self-conscious of your spider-veined legs.